I thought it was about time I shared more of my favorite maternity items! I know better than anyone what it's like to not want to spend a lot of money and to only get the things you really need. Pregnancy can be really hard on so many women and in my opinion a few things here and there that make you feel more comfortable and stylish make a world of a difference. Besides spending a little more time on my hair or makeup or splurging on that pedicure I never let myself get, I love getting a few basic pieces from my favorite sites that I know will fit me my whole pregnancy and that I can wear a bunch of different ways through every trimester. I am a huge fan of finding pieces that work for post baby too! I always tell my mom friends you can get through your whole pregnancy with one pair of maternity jeans, black leggings, white t-shirt, tank top, comfortable fitted bra, and of course a t-shirt/body con dress. I kind of stick to one outfit rotation every trimester depending on my size. Right now as I'm in my 3rd it's a lot harder to get dressed but I am loving t shirt dresses, maternity jeans with a maternity tank and then a baggy sweater or kimono over the top and you know I love me some jogger pants and a t shirt with a hat and denim jacket. My go to! 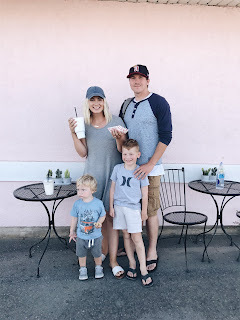 Below I linked some of my life savers this pregnancy as well as a BUNCH of cute items from my favorite sites that I have my eye on or have recently purchased!